In this episode we’re talking about something no one wants to deal with but each and every one of us will need to deal with. 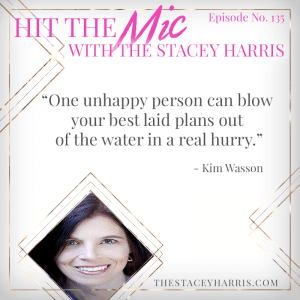 At some point in the course of your business you’ll need to handle a less than awesome conversation, and Kim is helping us figure those out. We talk about why clarity is important, listening is key, and figuring out how to respond from your brain and not your first emotional response. Grab your pen and start taking notes because this WILL come up. Kim Wasson, principal of Ivybay Consulting, has over 25 years of experience in the high-tech industry. This experience encompasses company size from start-up through Fortune 50, with associated diverse corporate cultures. She has held a range of positions from individual contributor through Vice President in Engineering, Program Management, and Operations, and holds both a Master’s degree in Engineering Management from Stanford University and a Bachelor’s degree in Computer Science from CSU Chico. Kim has both the education and practical background to offer consulting services IvyBay’s specialty areas. She brings a unique blend of common sense and structure to her approach to management, process, and coaching.